I do love a birthday. Some people may think that planning children’s parties are a bit overrated. I’m fully aware that Elsie won’t remember any of it. Other than what she later sees in the zillion of photographs that we will one day bore her with! Each and every birthday is a milestone that should always be celebrated no matter how old you are. Without the odd special day here or there life would become pretty dull in my book. I haven’t been this obsessed with planning an event since our wedding and we all know how stressful that can be. Thankfully this time around, there were no tears, except baby ones! No dramas, except a slight incident involving a small hand and a lit candle! Oh and no pacing the floor waiting for very important things like wedding rings to arrive a few hours before the big ‘I do’. There was a close shave on waiting for some photographs to arrive from France, but I’ll go into that another day! Once a planner, always a planner, and refreshingly this was a much much lovelier event to plan. 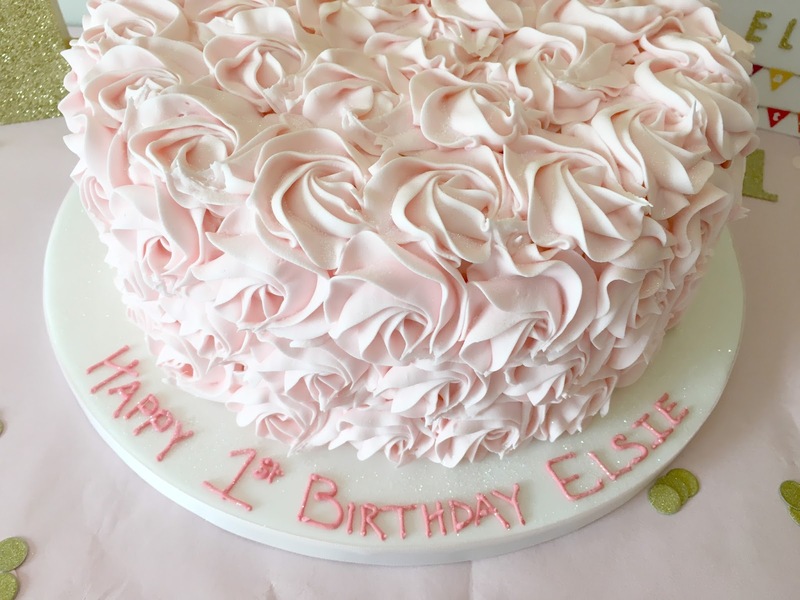 I was one very happy Mummy with how everything turned out. 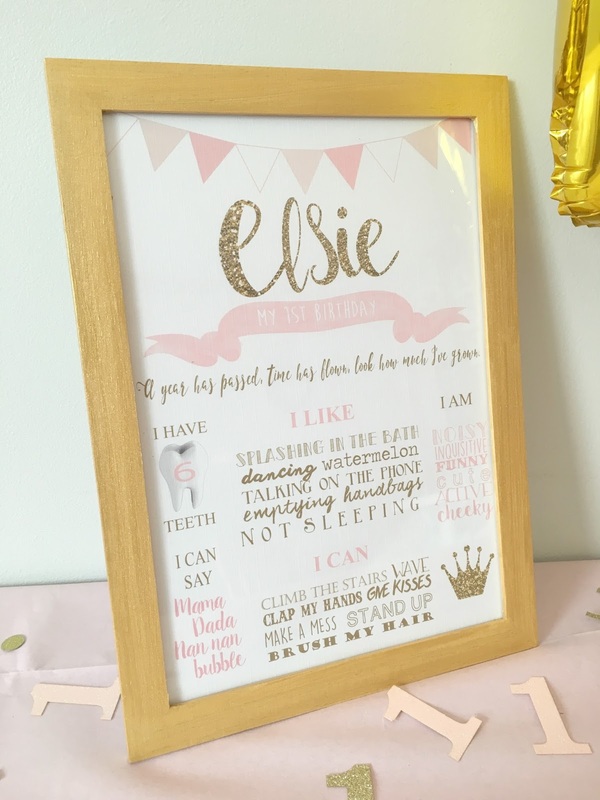 It all started one night a few months back, whilst mooching through Pinterest instead of sleeping (because I don’t tend to sleep very much in this house) I fell into the rabbit hole of gorgeousness and started planning our little girl’s big day. Word to the wise. Beware as you start mooching through the world of beautiful, crazy ideas that look oh so pretty and oh so simple on Pinterest. For normal folk like you and I- time is precious. If like, me, on some days you are still having to sacrifice a hair wash over a sit down breakfast because your spare time is so limited, then we can’t afford to waste time and money making marshmallow rice Krispies shaped into number ones that will evidently go into the bin (yep, that was me) or cutting out a load of gold glitter hearts only to forget to put them on the cake. Yep, that was me again. Only plan to carry out realistic crafts that your sanity, patience and valuable time can handle. As if life wasn’t busy enough. 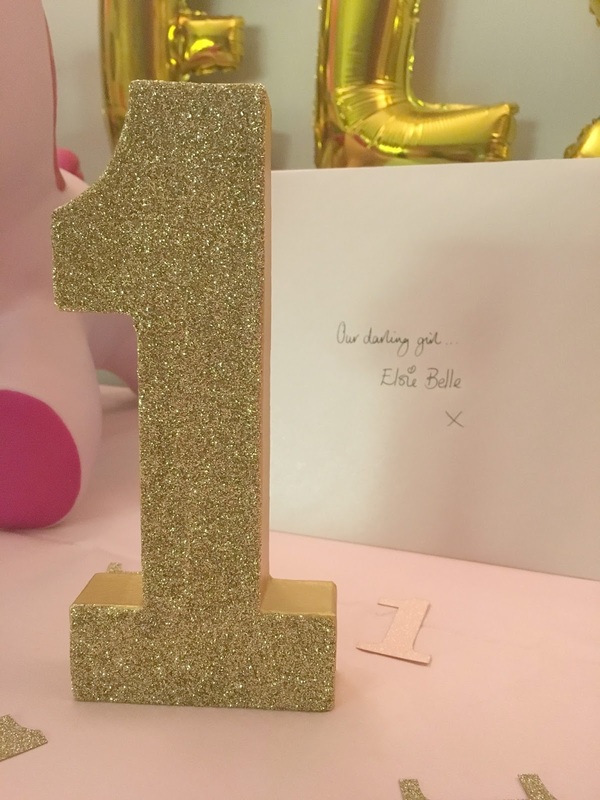 I also sent myself a little bonkers with a few DIYs for Elsie’s birthday parties. A few of these can be found on my Pinterest board that I created here, but I am planning on doing a few ‘how I did it‘ posts soon. 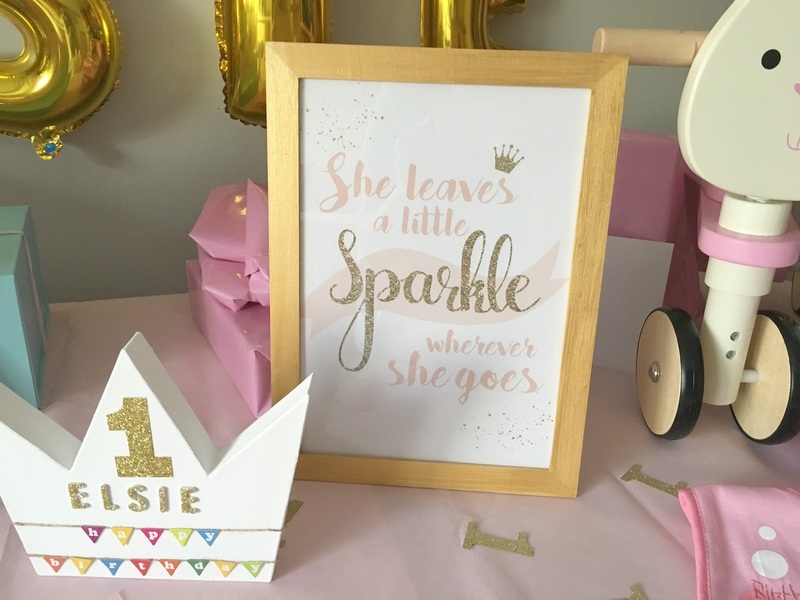 These include a Milestone Photography Frame, Table Centre Pieces, a High Chair Banner and of course, some good old party bags. 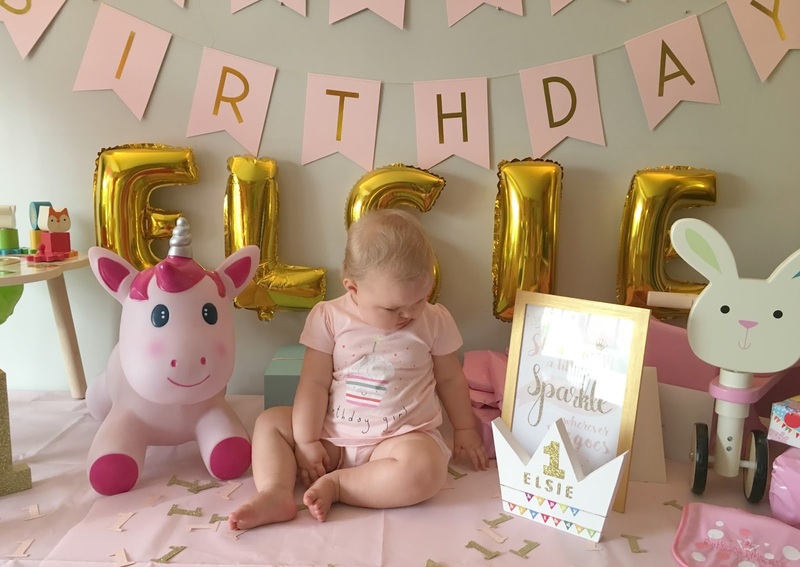 I’ve also had a few questions about the presents we brought Elsie so I am planning a little post on gift ideas I’d recommend and some I wouldn’t too soon. 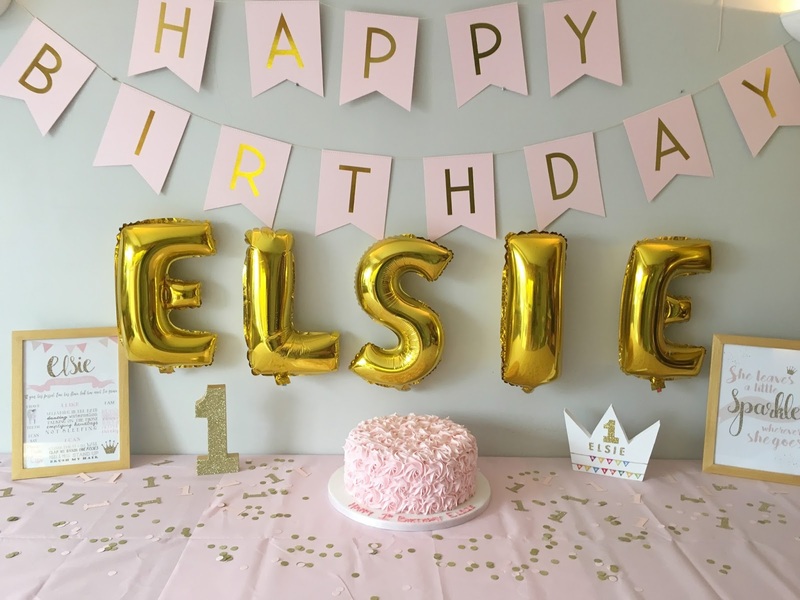 Thank you so much to all of you who sent lovely messages and well wishes to Elsie on her birthday. She is one very lucky and loved little lady.